Overall, it appears that outdoor events including LSU Baseball will not meet much weather resistance this weekend. You may way to keep the sprinkler system activated, as rainfall will come at a premium. Today and Tonight: On Friday, return flow off the Gulf of Mexico will allow low-level moisture to increase and therefore some humidity may be noticed. 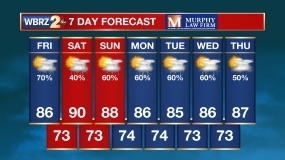 Again, high temperatures will climb into upper 80s and low 90s beneath partly sunny skies. Winds will be light and southerly. Overnight low temperatures will be in the upper 60s. Air quality is improved after several days of high ozone thanks to an increase in winds and mixing air in the atmosphere. The U.V. Index will remain very high at 10, making sunburn times less than 20 minutes. 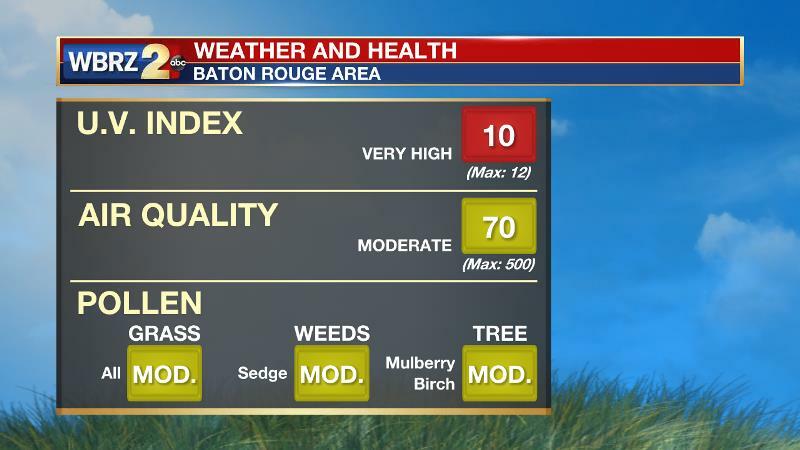 Also, grass, weeds and tree pollen is moderate. Up Next: Just enough moisture should be available for daytime heating to trigger an isolated shower or thunderstorm on Saturday afternoon. About 30 percent of the 13 parish, 3 county forecast area will receive measurable rain. Mother’s Day has a chance at showers as warmth continues. Any lawns and gardens that do receive a shower will be happy as the area is running a one-inch deficit for the month, so keep watering for now! There are signs that a slow-moving upper level disturbance could bring more appreciable rain coverage for the middle and end of next week. As an area of high pressures translates off the Southeast Coast, return flow will bring humidity back into the region. With a weakness in the upper level ridge, the atmosphere may uncap just enough for this moisture to trigger an isolated afternoon shower or and thunderstorm on Saturday afternoon. However, rain chances will remain quite low for the time of year. A ridge over the Southeast will create low rain chances and continue warm temperatures into early next week. Thanks to continued onshore flow, dew points in the upper 60s will make it feel a bit more humid than this week. There are some signs in the forecast models that an upper level trough moving from east to west across the Gulf of Mexico could enhance rain chances by the middle of next week. Both the GFS and ECMWF are on board with a closed off trough in the northern Gulf Tuesday and Wednesday. The trough will cool and destabilize the atmosphere enough for daytime heating to generate “pop-up” showers and thunderstorms. Areas of vorticity rounding the trough will only enhance shower development and this should be greatest on Wednesday.